Hingham residents know to watch for the early June procession through Hingham Square that kicks off Derby Academy’s graduation ceremonies. 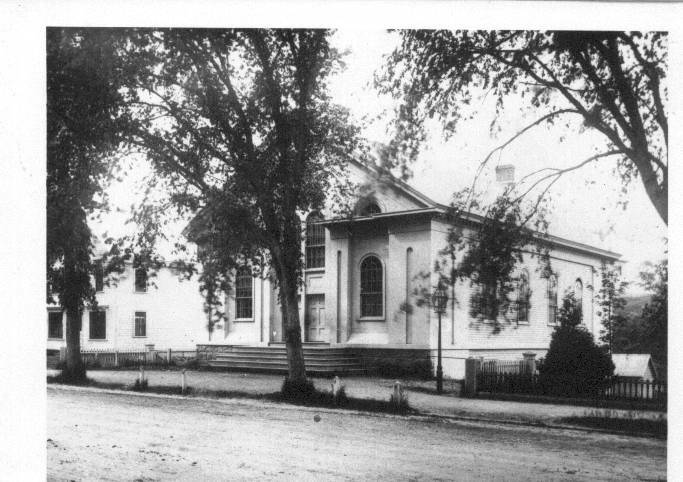 Boys in chapel dress and girls in white dresses march from the current Derby campus on Burditt Avenue down Fearing Road to New North Church, where the day’s ceremonies are conducted. This tradition is almost as old as the Academy itself. 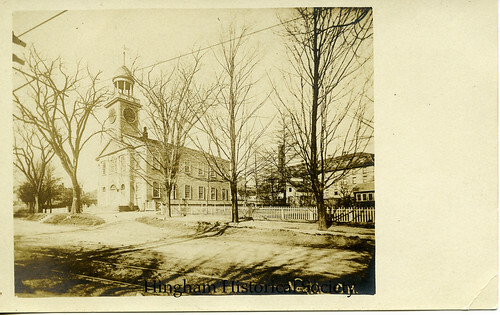 Ever since the New North meetinghouse was erected in 1806, at least part of Derby’s end-of-year ceremonies have taken place in it. Of course, the walk wasn’t always so long: when Old Derby Academy was the schoolhouse (from 1818 until the 1960s), the procession started on Main Street in Hingham Square. A Hingham Journal article from 1861 describes what was the “annual exhibition” held partly in New North and partly in Loring Hall. In those days, the focus was not on the graduating class but rather on the progress made by the student body as a whole. “Scholars” of all grades demonstrated the fruits of a year’s hard work by presenting dialogues, original oratory, dramatic performances, and, of course, music. A needlework display in the basement of Loring Hall showcased the girls’ handiwork. 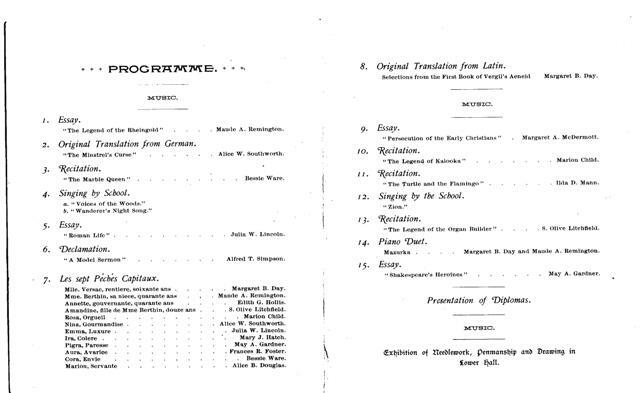 Exhibition programs from the 1833 and 1892 exhibitions, reproduced at the bottom of this post, differ in detail but not in overall conception or scope. The Journal described the 1861 Derby Exhibition as “one of the most agreeable [days] of the season,” and it was truly a major social event. 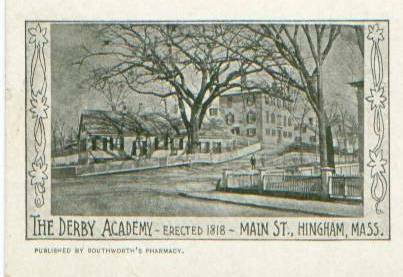 Derby Academy was Hingham’s only secondary school for much of the 19th century, and it continued to dominate our educational landscape for years afterward. The exhibition day was not just a chance for parents to see what their children had learned or for the oldest scholars to say goodbye in style: it was an opportunity for the entire community to come out, celebrate the onset of summer, hear a few interesting lectures, and listen to some good music. Did the ’61 Journal have any complaints? 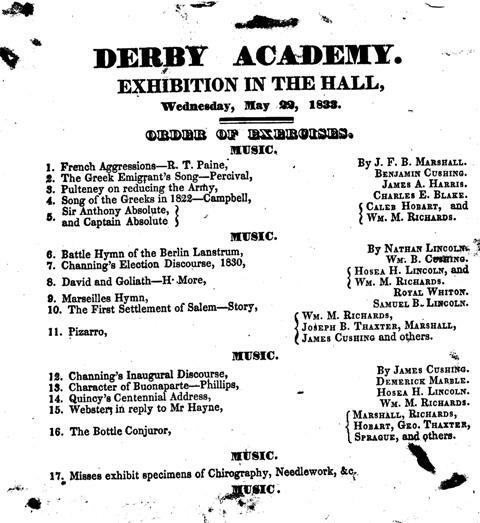 “If we were disposed to criticize,” it remarked, “the speaking would have been more effective had it been less rapid.” However, “the music was excellent, the hall packed to the utmost,” and we can catch a modern-day echo of the buzz and bustle of this celebration when the Derby students make their way through the Square next week. This entry was posted in Uncategorized and tagged children, churches, Derby Academy, education, Hingham Journal, Loring Hall.